I love sending handmade birthday cards to friends and family to help make their day a little more special. 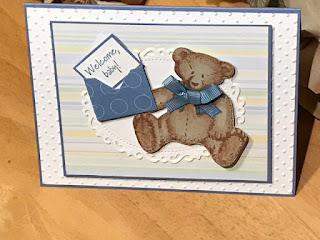 The following cards were a lot of fun to make using a couple of my favorite stamps sets from Stampin' Up - Pocket Fun and Lovely as a Tree. The pocket card has the sentiment behind the pocket as a little surprise. The flowers were made using a flower and daisy punch. I curled the edges to them a little dimension. There is a flower on the inside of the card and on the envelope to tie everything together. I used pearl-type embellishments as the centers. The main colors are Dapper Denim and Always Artichoke from Stampin Up. The flowers were punched from designer paper in my stash. Here's a tip: when you have a small scrap of designer paper, punch a couple of flowers and save for a future projects. I store mine in an extra plastic box but anything will work. I just love the Lovely as a Tree stamp set. It's great for any card for him and for her. This one I think is a perfect for a special guy - not too feminine. The tree is stamped in black and the background colors were quickly sponged on. The main color for this card is also Dapper Denim with black accents. The black ribbon tied in a know gives the card dimension and serves as place to pop-up the sentiment. I also stamped the inside of the card and on the envelope with the multi-tree stamp. Both cards are available for purchase on my Etsy shop, Handmade By Kathie K.